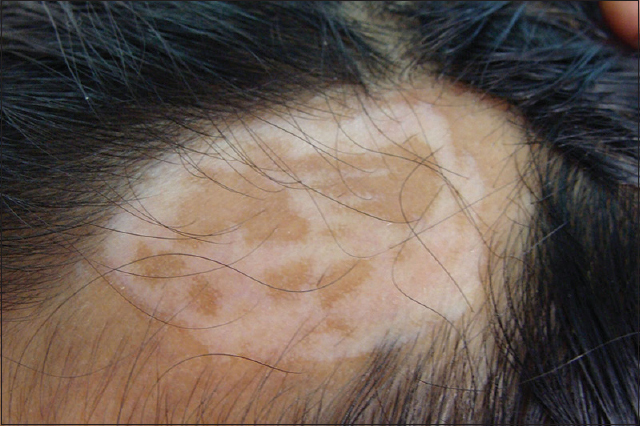 Context: Recalcitrant alopecia areata (AA) is not uncommon in clinical practice. In certain patients, treatment failures are known with almost every conventional therapy either singly or in combination. Aims: To study the efficacy of liquid nitrogen (LN) cryotherapy in patients with recalcitrant AA. Subjects and Methods: We present series of eleven patients of recalcitrant AA, who consulted us after getting no response to various modalities of treatment for 6 months. We treated them with LN cryotherapy every 2 weeks till significant hair regrowth or maximum five sittings (at 0, 2, 4, 6, and 8 weeks) whichever was earlier. Inclusion and exclusion criteria were applied. Each patient was counseled and a written consent was taken. Every session consisted of dual freeze and thaw cycles of 15 s each with a cryo unit spray. Two months of follow-up after last treatment was done to observe sustained re-growth of hair. Statistical Analysis Used: The clinical response was evaluated by using regrowth scale at 4th, 8th, and 16th week. Results: 11 patients were recruited, one patient dropped due to inability to attend follow-ups. Remaining ten patients completed the treatment and follow-up. Out of 10 patients, five patients (50%) showed an excellent response, three (30%) had a satisfactory response, one (10%) had a fair response, and one patient (10%) had a poor response. No serious adverse effects were seen. Sustained hair regrowth was seen in 80% of patients at the 16th week. Conclusions: LN cryotherapy may be worth trying treatment in the management of recalcitrant AA. 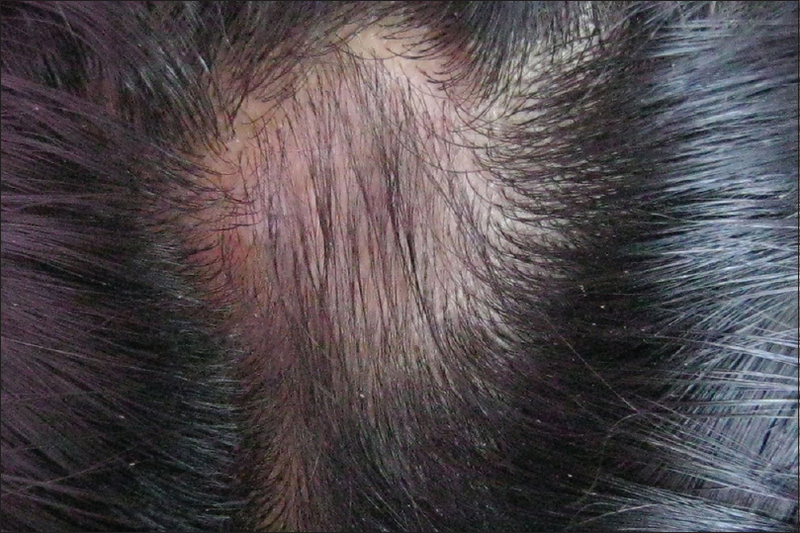 Alopecia areata (AA) or patchy, focal alopecia is the most common form of hair loss seen in dermatology outpatient department comprising of 25% of all the alopecia cases., The etiopathogenesis of AA is multifactorial consisting of genetic predisposition, autoimmunity, and environmental factors. AA in certain patients may progress to alopecia totalis (AT) or alopecia universalis (AU) which is up to 5–10%. Common modalities of treatment include topical medications as steroids, tacrolimus, anthralin, minoxidil, and psoralen with ultraviolet A solution, narrow band ultraviolet B, immunotherapy with diphenylcyclopropenone or squaric acid dibutyl ester (SADBE), and systemic therapy such as oral corticosteroids, levamisole, methotrexate, azathioprine, and others. The treatment given is mainly for cosmetic reasons and to halt the progression of the disease. Though AA is a common disease, unfortunately, has no uniform successful therapy. There are few reports of AA treated with cryotherapy. In this report, we study the efficacy of liquid nitrogen (LN) cryotherapy for the treatment of recalcitrant cases of AA. A study was conducted to treat the recalcitrant AA with LN cryotherapy who did not respond to various modalities of treatment taken for 6 months. (Those AA patients who came to our consultation only when treatment given earlier with various topical and systemic medications taken for a period of 6 months did not show response were considered as recalcitrant AA). Investigations such as complete blood count, liver and renal function test, fasting blood sugar, lipid profile, erythrocyte sedimentation rate, thyroid profile, and antinuclear antibody were done before treatment. A written consent was taken from all patients and counseled in detail about the modality of treatment. The pain was minimized in most patients by application of topical local anesthetic agent (2.5% lidocaine and 2.5% prilocaine) kept 1 h prior to therapy. Recalcitrant nonprogressive AA not responding to other modalities of treatment taken for 6 months. Patients not willing to follow the protocol. A handheld cryo unit containing LN as a cryogen was used. The cryo unit was comprised a vacuum insulated container of 500 ml with a brass spray tip of 1 mm. The spray tip was held over the alopecic patch kept at a distance of 1 cm. Each lesion was treated with LN cryotherapy every 2 weeks for maximum five sittings (at 0, 2, 4, 6, and 8 weeks) or till expected hair regrowth, whichever was earlier with a follow-up for next 2 months to evaluate the persistence of hair regrowth after therapy. A dual freeze-thaw cycles were sprayed in paint brush-like fashion from one end of lesion moving up and down across each lesion [Figure 1]a. 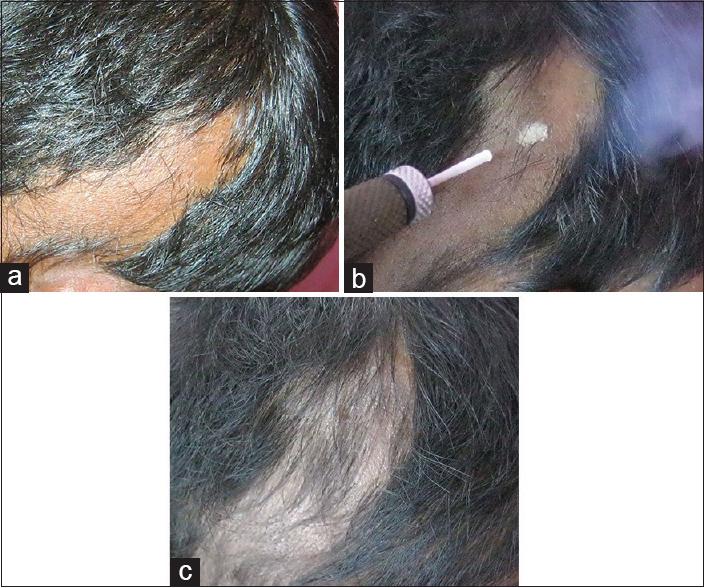 Method of administration of LN cryotherapy in alopecia areata shown in [Figure 1]a, [Figure 4]b. Each cycle consisted of 15 s freeze followed by 15 s thaw. Development of uniform frost over the alopecic patch at the site of treatment was considered as an end point. 4 score (regrowth ≥ 75%) excellent response. Cryotherapy was given as a monotherapy except for antibiotics and anti-inflammatory drugs given for 5 days after therapy to prevent secondary infection no other treatment modality was given between the follow-ups. Out of 11 patients, six patients were male and five patients were female, aged from 12 to 40 years with a duration of disease ranging from 1 to 5 years with < 25% of scalp involvement. Three patients had multiple patches on the scalp, and one patient had AA patch over beard area. The clinical profile of each patient is given in [Table 2]. The positive therapeutic response was interpreted as regrowth of terminal hairs within the alopecic patches at the 4th, 8th, and 16th week. Five patients (50%) showed an excellent response out of which two patients (20%) showed response at the 6th week [Figure 1]c and [Figure 2], one patient (10%) showed response after two sitting (4th week) [Figure 3]b, serial number 2], with further no requirement of LN cryotherapy sitting and two patients (20%) showed excellent response at the 8th week [Figure 4]c. Three patients (30%) had a satisfactory response, out this 1 patient showed a fair response at the 4th week [Figure 5]a and further upgraded to satisfactory response at the 8th week [Figure 5]b after receiving two more sittings of LN cryotherapy. One patient (10%) had a fair response [Figure 6], and one patient (10%) had a poor response [Figure 7] which was evaluated at the 8th week. One patient lost follow-up. All patients showed sustained regrowth of hair at the end of 16th week of follow-up except one patient (serial number 8) who had a poor response at the 8th week. Adverse effects with cryotherapy were noted [Table 3]. Transient erythema and edema were the common immediate effects observed after cryotherapy in all patients. AA is a common form of noncicatracial alopecia involving the scalp and/or body; it accounts for 2–3% in the UK and USA, 3.8% in China, and 0.7% in India., There is a lifetime risk of 1.7%. Both males and females are equally affected and are prevalent in 30–59 years of age. The hair follicle elements altered in AA are epithelial and melanocytes with an increase in Langerhans and T cells, so it can be considered as hair follicle-specific autoimmune disease triggered by environmental factors in genetically susceptible individuals.,, It has been hypothesized that AA patients have high levels of hair follicle-specific antibodies in their peripheral blood. It is also believed that an immune privileged site is compromised in AA with increased expression of major histocompatibility complexes I and II, decrease in naturally occurring immunosuppressive proteins like transforming growth factor beta, alpha-melanocyte stimulating hormone, and insulin growth factor 1, with higher expression of adhesion molecules in the perivascular and peribulbar hair follicular epithelium. Thus, activating T cell, autoantibodies, promotes cytokine release mainly perifollicular leading to dystrophic and miniaturized hair. Association with autoimmune diseases such as thyroid disease, anemia, diabetes mellitus, vitiligo, autoimmune polyglandular disease, systemic lupus erythematosus, and psoriasis are known. Although spontaneous remission may occur in a good number of AA patients, there are certain patients of AA who are fairly resistant to one or more type of treatments. This poses a challenge to treat such recalcitrant AA patients. As well some patients are at risk of going into more severe disease form of AT or AU in context to prepubertal onset (50%), autoimmune systemic disorder (10–50%), atopic type (30–75%), or elderly onset (25%). Inadequate response to given treatment or persistence of patches of AA leads to significant psychological stress and may have a negative impact on the patient's quality of life. Despite availability of a number of topical and systemic modalities of treatment, there remain certain numbers of patients who may not be responsive to one or more therapies. Hence, alternative modality of treatment with less adverse effects was worthwhile in most of our patients. Hence, we decided to try LN cryotherapy to stimulate hair growth in patients of recalcitrant AA. Cryotherapy may act through either singly or by a conglomeration of the following mechanisms resulting in hair regrowth in AA. After initial vasoconstriction with cryotherapy, there is a significant local vasodilatation during the thaw period as the temperature reaches zero degree Celsius. Thus, cryotherapy is speculated to dilate the vessels around the affected hair follicles, with an increase in the blood flow leading to follicular hair regrowth., Moreover, local edema and inflammation occurring after cryotherapy may play a role in inducing vasodilatation. Cryotherapy is also speculated to inflict partial damage to keratinocytes, especially the antigenic components of the hair folliclekeratin16 and trichohyalin, which are targeted by antibodies and thus, further decrease in damaging perifollicular infiltrate.,, Cryotherapy may also alter tissue Langerhans cells, which in turn could alter the process of antigen presentation with further decrease in T cell infiltration. As it is known, the white hairs are spared in AA; it is hypothesized that melanocytes may have a role in the pathogenesis AA. Hence, cryotherapy may also act by destructing the melanocytes further preventing their role in the initiation of AA. Interestingly, leukotrichia was observed in one of our patients, which resolved on follow-up [Figure 5]a and [Figure 5]b. This could be secondary to temporary damage to melanocytes by cryotherapy leading to hair regrowth as speculated by one of the workers. Amirnia et al. studied 120 patients of AA where they compared intralesional triamcinolone injections with LN cryotherapy and noticed that AA patches treated with intralesional triamcinolone injections gave superior results but concluded that cryotherapy treatment alone can induce hair regrowth in AA. Gita and Mohammadreza evaluated the efficacy of LN cryotherapy versus topical betamethasone lotion as a management in recalcitrant AA, where the response was good in both the groups and suggested LN cryotherapy as possibly effective treatment in resistant and isolated AA, especially in children who are susceptible to side-effects of immunosuppressive agents. We observed effective hair regrowth in 90% of our patients with LN cryotherapy as monotherapy and persistence of hair regrowth in 90% of patients on further follow-up over 2 months without any further treatment. 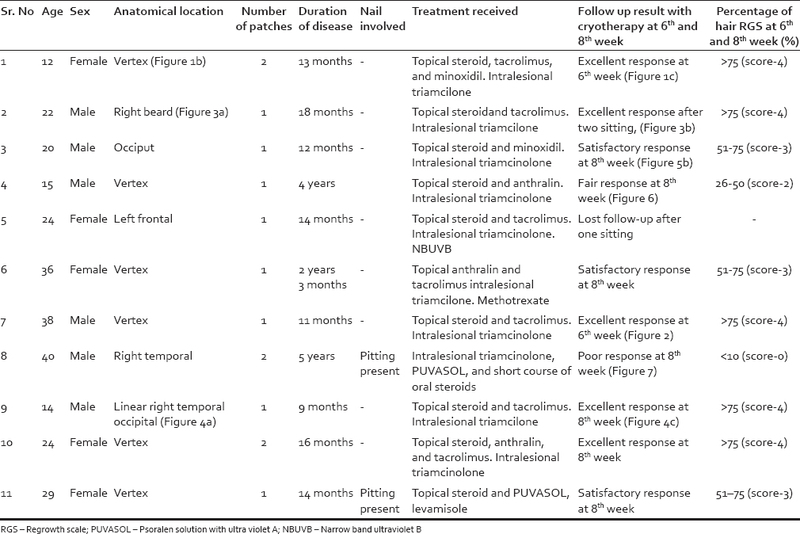 Interestingly, we noticed effective response in patients who were previously treated with topical, intralesional steroids in most of the patients, and systemic steroids in few [Table 2]. Similarly, Radmanesh M and Azar Beig M (who used carbon di-oxide CO2 as cryogen) also noticed and suggested cryotherapy as an alternative method for recalcitrant AA, especially those who did not respond to topical and intralesional steroids like our set of patients. In a Korean study which used cryotherapy treatment for AA, interval of more than 3 weeks seemed to have shown relatively poor response rate. Gita and Mohammadreza and Hyung et al. got success after frequent administration of cryotherapy also Gita and Mohammadreza used shorter duration of cryotherapy of 2–3 s of freeze and 3–5 s of thaw with good success,, such did not work in most of our earlier patients (our unpublished data). Hence, we decided to administer LN cryotherapy at a shorter interval that was every 2 weeks and with longer duration of freeze and thaw of 15 s, respectively. None of our patients had permanent scarring, and it has been mentioned that cicatrization can be minimized by freezing <30 s.
We would like to admit the limitation of our study that a number of patients in the study is small. Therefore, larger multicentric studies on recalcitrant AA treated with LN cryotherapy would give better insight about its efficacy and suitability. Hence, we recommend LN cryotherapy only for the recalcitrant AA patients rather than as afirst-line management in the treatment of usual AA patients. Topical immunotherapy with Diphenyl-cyclopropenone (DPCP) or squaric acid dibutyl ester (SADBE) could have been worth trying in our patients of recalcitrant AA before using LN cryotherapy; however, these were not available at our place, and we lack expertise in using it. Resistant AA is not uncommon in clinical practice, and treatment failures are known with almost every conventional therapy either singly or in combination. Alternative therapeutic approaches should be made available, which must be suitable for administration, should not cause permanent side-effects and should produce sustainable hair regrowth. We tried LN cryotherapy as a monotherapy in such patients with good success. We believe that LN cryotherapy is a cheap, easily available option in the dermatologist's offices, and may be worth trying in the management of recalcitrant AA. To the best of our knowledge, this is thefirst series of cases treated with LN cryotherapy in recalcitrant AA with the observation of sustainable regrowth on follow-up in India. LN cryotherapy may be worth trying treatment in the management of recalcitrant AA. Ganjoo S, Thappa DM. Dermoscopic evaluation of therapeutic response to an intralesional corticosteroid in the treatment of alopecia areata. Indian J Dermatol Venereol Leprol 2013;79:408-17. Seetharam KA. Alopecia areata: An update. Indian J Dermatol Venereol Leprol 2013;79:563-75. Schwartz RA, Janniger CK. 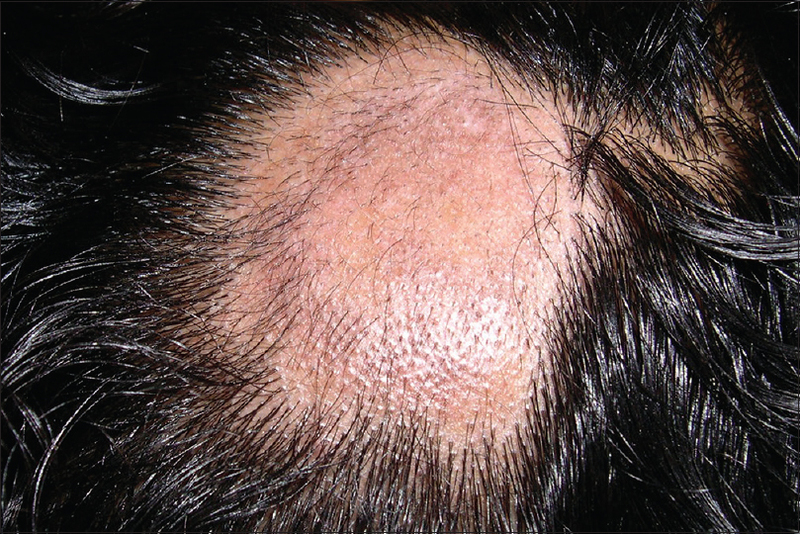 Alopecia areata. Cutis 1997;59:238-41. Radmanesh M, Azar Beig M. Cryotherapy as an alternative therapy for the treatment of recalcitrant alopecia areata. Iran J Dermatol 2013;16: 49-52. Sharma VK, Dawn G, Kumar B. Profile of alopecia areata in Northern India. Int J Dermatol 1996;35:22-7. Tan E, Tay YK, Goh CL, Chin Giam Y. 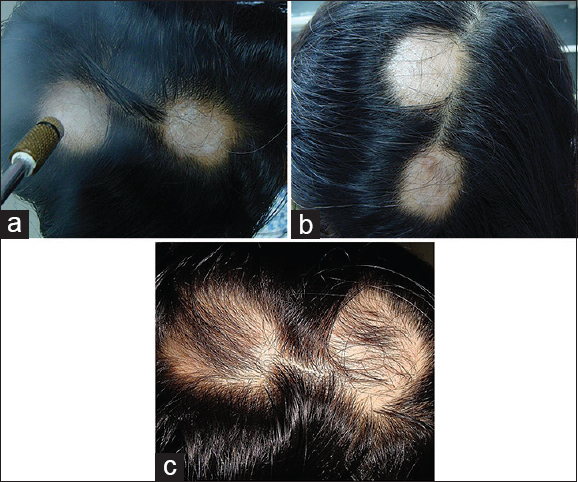 The pattern and profile of alopecia areata in Singapore – A study of 219 Asians. Int J Dermatol 2002;41:748-53. Christoph T, Müller-Röver S, Audring H, Tobin DJ, Hermes B, Cotsarelis G, et al. The human hair follicle immune system: Cellular composition and immune privilege. Br J Dermatol 2000;142:862-73. Pimentel CB, Moraes AM, Cintra ML. Angiogenic effects of cryosurgery with liquid nitrogen on the normal skin of rats, through morphometric study. An Bras Dermatol 2014;89:410-3. Gita F, Mohammadreza R. Liquid nitrogen cryotherapy vs. betamethasone lotion in the management of alopecia areata. J Clin Med Res 2013;5:18-22. Tobin DJ. Characterization of hair follicle antigens targeted by the anti-hair follicle immune response. J Investig Dermatol Symp Proc 2003;8:176-81. Amirnia M, Mahmoudi SS, Karkon-Shayan F, Alikhah H, Piri R, Naghavi-Behzad M, et al. Comparative study of intralesional steroid injection and cryotherapy in alopecia areata. Niger Med J 2015;56:249-52. Hong SP, Jeon SY, Oh TH, Lee WS. Retrospective study of the effect of superficial cryotherapy on alopecia areata. Korean J Dermatol 2006;44:274-80. Hyung OK, Seok D, Won S. Effect of cryotherapy with liquid nitrogen on alopecia areata. Korean J Dermatol 1994;32:421-6. Sharma VK, Khandpur S. Guidelines for cryotherapy. Indian J Dermatol Venereol Leprol 2009;75:90-100.